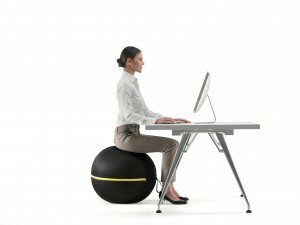 Compact, Comfortable and interactive, with highly detailed features, the Wellness Ball Active Sitting allows the user to improve their posture while they work and aids in the strengthening of the muscle structure that protects the spine effortlessly, at any time, where ever you are, by just sitting. Moreover, with the execution of specific exercises, the Wellness Ball Active Sitting allows you to develop toned muscle and improve your balance and flexibility. Utilizing the Wellness Ball Active Sitting during working hours, or within any other situation allows you to adopt correct postural alignment aiding in the prevention of back pain. This dynamic sessions enhances the likelihood of eliminating one of the main cases of back pain: maintaining a static position for long durations. Wellness Ball™ Active Sitting performs a series of micro-movements that improves the stabilizing action performed by the abdominals and lower back muscles. The Wellness Ball™ Active Sitting is also a fitness tool allowing you to enhance your stability, tone, strength and flexybility within a small space. Designed and patent by Technogym, the Wellness Ball Active Sitting is solely Italian. First of all, its components and materials are made entirely by Italian artisans. To demonstrate the care and attention typically provided by Italian production, this dynamic seating apparatus is made of high quality PVC and does not contain Phthalates or Latex of which are potentially harmful to a person’s health. Thanks to the multi-layer fabric that covers it, the Wellness Ball Active Sitting has antiperspirant and anti-slip capabilities, similar to a pair or running shoes, preventing the likelihood of sweating and slipping when using it. Moreover, the cover can be washed in the washing machine at 30° demonstrating its functionality both prior and after use. With the addition of a handle, the Wellness Ball™ Active Sitting is easy to maneuver and position correctly in every-day use. The twin density of the product, of which is weighted at the bottom, enhances stability and promotes better centering of gravity, thus greater comfort in all circumstances. 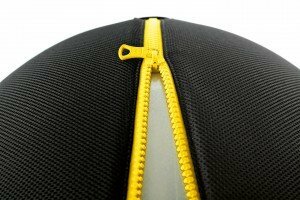 To ensure greater security the Wellness Ball Active Sitting is also anti-explosive, anti-bacterial and flame resistant. Besides being equipped with a label allowing you to personalize the product, the Wellness Ball Active Sitting also has a QR code imprinted on the surface of the seat. When photographed with your smart phone or tablet, it allows the user to access specific exercises. The Wellness Ball Active Sitting's diameter is 55cm. The hinge nylon nautical helps you size the ball during inflation reducing the likelihood of inflating beyond the recommended limits. However, Wellness Ball Active Sitting™ is in fact ready to be used when the hinge is totally relaxed.